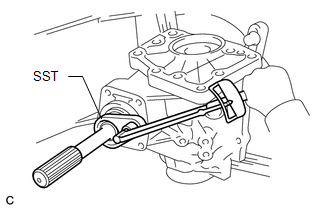 (a) Using SST and a torque wrench, measure the preload of the backlash between the driven pinion and ring gear. Use a torque wrench with a fulcrum length of 130 mm (5.12 in.). If the preload is too high, replace the transfer pinion bearing spacer with a new one. If the preload is too low, tighten the transfer gear nut further by turning it 5 to 10 degrees at a time, and then measure the preload again. Repeat this operation until the specified preload is obtained. If the preload remains too low even after the transfer gear nut has been tightened to a level in excess of the specified torque, loosen the transfer gear nut and check its threads and those of the driven pinion for damage. If there is no damage, replace the transfer pinion bearing spacer with a new one. 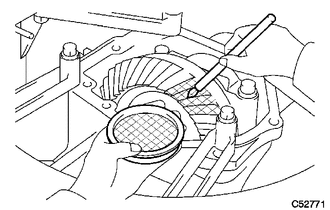 Apply hypoid gear oil to the threads and repeat the steps above. Write down the preload for use as a reference during the total preload measurement. 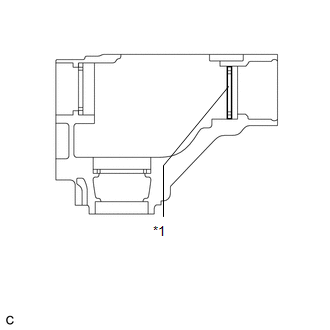 (b) Using SST and a torque wrench, measure the total preload. 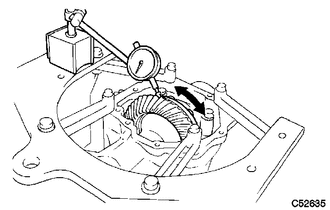 (a) Using a dial indicator, check the backlash of the ring gear. 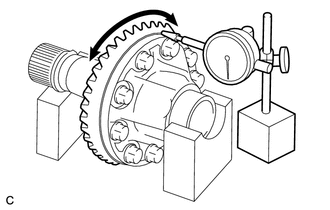 (b) Turn the driven pinion to rotate the ring gear 10 times or more clockwise and 10 times or more counterclockwise. 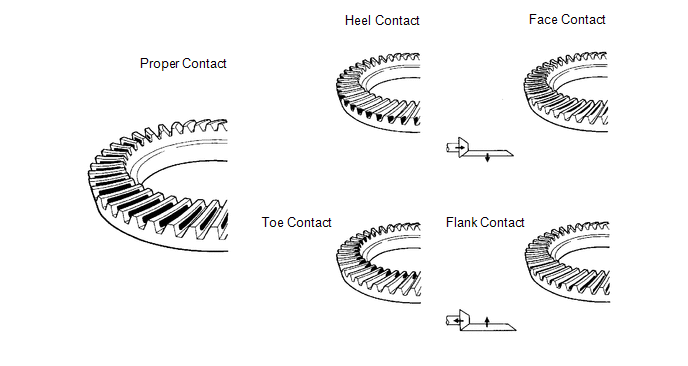 (c) Rotate the ring gear to inspect the tooth pattern. (a) Place the transfer ring gear mounting case on the V-blocks. (b) Using a dial indicator, check the runout of the ring gear. If the runout is more than maximum, replace the ring gear with a new one. 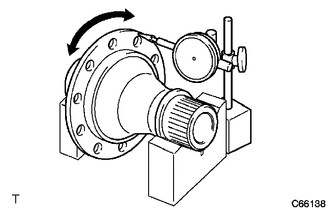 (b) Using a dial indicator, check the runout of the transfer ring gear mounting case. If the runout is more than maximum, replace the transfer ring gear mounting case with a new one.